The giant panda is a bear native to central-western and south western China. It is easily recognized by its large, distinctive black patches around the eyes, over the ears, and across its round body. This nanoblock Giant Panda set is a remarkably accurate reproduction of a real giant panda standing on all four legs. 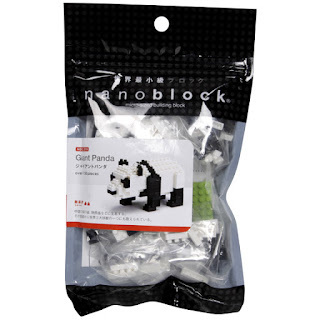 The nanoblock Giant Panda set comes in a zip-lock bag packaging, with over 150+ pieces of building blocks, and a sheet of instruction paper to show you how to build your very own Giant Panda. This is a "Level 2" nanoblock set, so it's relatively easy to put together. I was able to build this giant panda in about 25 minutes, and the instructions are pretty clear. Here are some pics of the build process. And here is the final result. As you can see, it's a really nice looking Giant Panda. This nanoblock Giant Panda retails at RM29.90, and you can get them from Toys R Us, Action City, Kinokuniya, Popular Bookshop and XL Shop in Malaysia now.